Earlier this spring, I reported on a new chapter of Girl Develop It that launched in the Burlington area. The national nonprofit aims to build coding skills among professional women — both because women are underrepresented in technology fields, and because coding skills are in demand in the marketplace. Women who can not just use but program computers increase their earning potential substantially. Burlington chapter founder Maureen McElaney is part of GDI's intended audience. She works in sales at Dealer.com, but is interested in learning how to build the products she's selling. McElaney was involved with GDI in Philedelphia before relocating to Vermont with her husband last September; she started the chapter here so she and others like her could take low-cost coding classes. 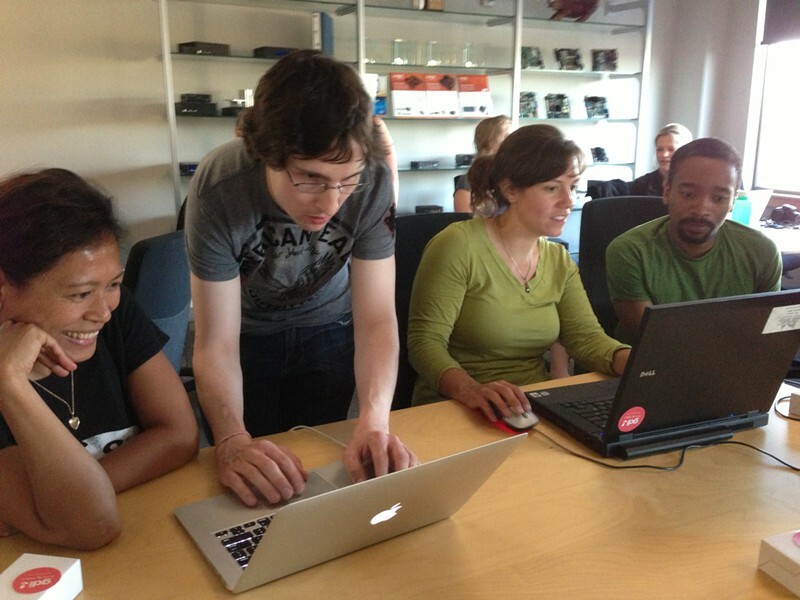 The first GDI Intro to HTML and CSS sold out; a second is planned for June. Last night's "Code & Coffee" event was a more informal gathering. About 20 people filled a conference room at Logic Supply in South Burlington and chatted over laptop screens while tinkering with projects. Attendence was split between people who came to teach and those who came to learn. The teachers came from Dealer.com, EatingWell, Ringmaster Software, Brandthropology and Logic Supply. The learners included a graphic designer, a business consultant and a retired programmer who wanted to build a website for her business. One woman, who asked that I not use her name, admitted, "I just got a smartphone. I'm super lame." She came to the coding session, she said, because she wants to create an intranet for her nonprofit organization so that their far-flung statewide offices can share resources online. She hopes to learn the skills she needs to build it — or at least to manage its creation.